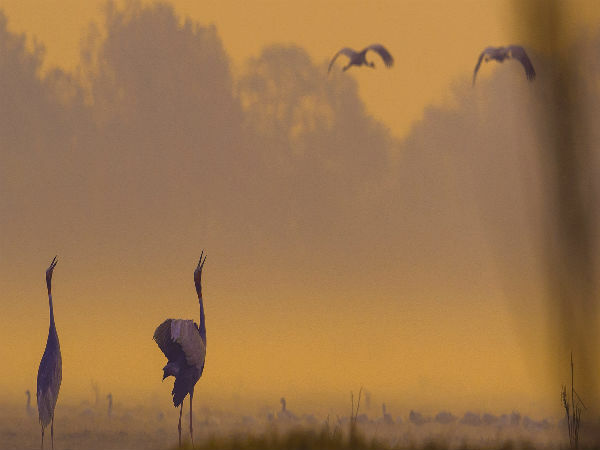 Earlier known as the Bharatpur Bird Sanctuary, the Keoladeo National Park has been recognised as one of the most important bird breeding and feeding grounds in the world. The place was originally a royal hunting reserve in the 1850s apart from being a game reserve to the royals and the British. In the year 1982, it was declared as a national park and was declared as a World Heritage Site by UNESCO in the year 1985. Locally known as Ghana, the reserve spans to 29 sq km of dry grasslands, woods, swamps and wetlands. Year after year, countless migratory birds come here to make it their home for wintering and as well as for breeding. The sanctuary is considered as one of the richest bird areas in the world and is well for being the nesting grounds to its resident birds and home to various migratory birds which also include water birds. Best Time To Visit: The best time to visit the sanctuary is from the months of August to February, although the place is open throughout the year. By Air: The nearest major airport is the Indira Gandhi International Airport at Delhi, which is located at a distance of 207 km from here. The airport is well connected to major domestic airports across the country, such as Mumbai, Bengaluru, Kolkata, etc. and to a number of them abroad as well. The total driving distance from Delhi to Deeg is approximately 221 km; and, it would take you about 4 to 5 hours to reach the historic town from Delhi. One can reach Keoladeo by taking the following routes from Delhi. The town of Mathura is considered as the birthplace of Lord Krishna, due to this reason the place holds a very important place in Hinduism and with the devotees of Krishna. Like Vrindavan, Mathura too has a large number of temples and ghats across the banks of Yamuna, it believed that Krishna was born in a prison here on a rainy night. Out of the large number of temples here, the Sri Krishna Janmabhoomi Temple and the Dwarkadhish Temple are considered the most important. As the name suggests, the Janmabhoomi Temple is constructed on the site, which is believed to have been the birthplace of the divine child. One can still find a cell in the prison, which is said to be the birthplace of Krishna. Next is the Dwarkadhish Temple, where Krishna is worshipped as the king of Dwarka, this temple was constructed in the year 1814 by a person named Seth Gokul Das Parikh. The national park is a stunning place of tranquility which is placed aptly between the tourist hubs of Agra and Jaipur. The forests here exhibit a semi arid type of vegetation, also given the fact that they are dry deciduous in type and are also home to several medium-sized trees and shrubs. A major part of the park is occupied by the kadam, jamun and babul trees and is home to an indigenous plant known as Pilu which is found only here. With plenty of water resources, there are plenty of fish which attract the waterfowls in large numbers. One of the best ways to enjoy the beauty of the place is to walk through it with a professional who would guide you and help you spot not only the large avian visitors but also various animals, such as the black buck, sambhar, hyenas, striped jackals etc.